Road running is to The Great British Bake Off, what trail running is to Bear Grylls’ Born Survivor. In road running, all the ingredients are nicely laid out. The setting is safe and familiar. The recipe for your run is repeated. Timings are fixed. And your home is nicely pre-heated for your imminent return. Trail running is different. Before you begin, it is quite unnecessary to wash your hands. With each episode the setting changes. Instead of just being a backdrop, the scenery is interactive. Technique is still key; but there’s less marks for preparation, and far more for improvisation. And while undeniably everything has gone wrong if you’re eating wild animals or drinking your own urine – the ability to tough it out and laugh at adversity is all part of the adventure. So with a nod to the wild reality of off-road running, here’s a behind-the-scenes-look at everything it takes to survive a big day out on the trails. Sure, your run around the park is a bona fide trail run. It’s okay to linger here for a while on the grassy-verge of the sport, where you don’t have to worry what is underfoot. But once you take the plunge, you’ll realise that clever footwork is not only necessary for the more challenging stuff – but is one of the key elements that makes trail running more interesting. Here’s the skills you’ll want to add to your arsenal. 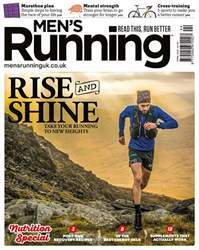 Give your running a boost with the April issue of Men’s Running – our nutrition special. Whether you’re in need of a reliable mid-marathon energy gel, a pre-run pick-me-up or a recovery-boosting shake, this month’s Best in Test is your go-to guide for the best sports nutrition products on the market – as decided by our team of independent runners. Elsewhere, spring marathoners can take advice from our very own marathon man, Steve Way, who tells you exactly what you should be doing with two months to go. Or, if off-road is your thing, resident trail guru Matt Maynard’s ‘Trail Skills’ feature explains how to hone the skills you’ll need to excel when the going gets muddy. All that, plus the usual training advice, race reports and nutrition know-how to help you run stronger than ever this spring.